It is a truism that where ever you live, you think the place you're living in is better than anywhere else. Well welcome to Nanaimo, The Harbour City, one of the most desirable, livable, small cities in North America. In Nanaimo's case, others also think our area is pretty special! In 2004, the readers of Conde Nast Traveler magazine ranked Vancouver Island as the Top North America Island.This is the fifth consecutive year Vancouver Island has had this honour. And readers of Travel + Leisure recently named Vancouver Island as the Best Island Destination in the Continental US/Canada. Now those are some serious accolades from traveling folks that know a good thing when they see it! Nanaimo offers the Best of British Columbia and we feel very lucky to live here. Our community is surrounded by natural beauty - ocean, islands, mountains, rivers, lakes, wildlife. We have hundreds of parks, 250 kilometres of trails, both bike and walking and a fantastic Harbourside Walkway which showcases our most beautiful asset, Nanaimo's famous harbour. Lots of festivals and events. 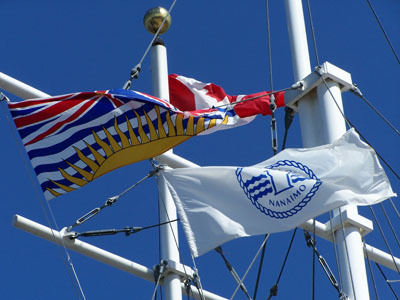 Nanaimo is centrally located on Vancouver Island in beautiful British Columbia on the west coast of Canada. You can find us at latitude 49° 11’ north, longitude 123° 58’ west or visually at Google Maps. Nanaimo is well positioned to offer the perfect base for all of your Vancouver Island explorations. In fact in our central area we have the vast majority of the island's greatest attributes: golf courses; beaches; Gulf Islands; murals; forest groves; scuba diving; snorkeling with the seals, sking and fishing. And everything else is within easy day tripping distance. Victoria is 1.5 hours away. Oceanside is 25 minutes away. Cowichan Valley is 40 minutes away. Comox and the Cowichan Valley is 1.25 hours away. Nanaimo is the perfect base. And talk about access. We have 4 ferry terminals in our town. Two seaplane bases and one land based airport. Getting here's not the problem, it's the leaving part. We have a myriad of things to see and do! Enough to keep you busy for a while! In 2004 our population was 78,271. Nanaimo is attracting many newcomers so expect to see that number rise quickly in the next few years. Nanaimo is often mispelled. Variations include Nanimo, Naniamo or as Naimo. One of our great redeeming features is the incredibly mild, comfortable weather we have and it almost never snows here, although Mt. Washington ski hill is just over an hour from Nanaimo. In the past few years Nanaimo has tied with Victoria as Canada's Most Comfy City according to Environment Canada! The cities with the most comfortable weather are determined by selecting 23 "comfortable" weather categories, including the mildest winter, spring and fall; the most sunshine; the lightest winds and the lowest humidity. Check out today's mild weather! And have a look at our climate statistics. Mild huh! Although our winter weather is mild, it does rain fairly frequently from November to March. Make sure to pack an umbrella and raincoat or windbreaker. Snow is infrequent but the rain does help us to create a beautiful rainforest! The bonus is after those winter storms, the beach combing is at it's best! And with the cold weather brings incredible visibility in the water. Scuba diving is at it's best in the winter months. Not sure what to do while you're in Nanaimo? Guests to Nanaimo, and locals, often list the following as the best experiences. Walk along our the Harbourside Walkway The 5 kilometre (3 mile) walkway is our #1 attraction. You can walk from BC Ferries Departure Bay Terminal past Stones Marina and The Buccaneer Inn towards the Yacht Club, a small beach and along to Maffeo Sutton Park. Here you'll find a huge children's playground, lagoon, beach, fishing pier, public washroom and several food vendors. Continue along past Pacifica, Nanaimo's new waterfront luxury condo's, to Pioneer Plaza home of lots of interesting shops, floatplanes and HarbourLynx high speed passenger ferry. The Boat Basin is just in front of you with it's great floating restaurants and foot ferry to Protection Island and the Dinghy Dock Floating Pub and Restaurant off Protection Island. Eat a Nanaimo Bar Our hometown treat traces back to our coal mining days. Get the Official Nanaimo Bar recipe! Spend a day at Newcastle Island Our local gem. Like Stanley Park in Vancouver, but without the people. Ferries leave from Maffeo Sutton Park from the first sunny weekend in May until late September. Great for beachcombing, kayaking around, sailing to, walking, camping or lazing about for the day. Head to one of our hundred's of other parks like Piper's Lagoon, Neck Point, Cable Bay or Bowen Parks where you'll find a myriad of diverse ecosystems and hours of outdoor enjoyment. Participate in one of our festivals Bathtubs racing around the harbour and out into Georgia Strait? Only in Nanaimo! How about Dragonboating, Silly Boats or the Maple Sugar Festivals? Shop Downtown Nanaimo is home to great little boutique shops along the waterfront, Downtown and in the Old City Quarter. Get a sense of our history Historical walking tours are available from tour companies and through a series of self-guided tours painted on downtown sidewalks. Make sure and stop in at the Nanaimo Museum across from the Boat Basin and learn more about our First Nations people, coal mining and the movers and shakers of yesteryear. Go outside Golfing is available year round at the 19 different courses in our area (in fact over three quarters of all the Island's golf courses are within 45 minutes of Nanaimo). Snorkel with the seals, dive one of our 3 artificial reefs, bike the Abyss, jump off a bridge at the Bungy Zone, paddle around Newcastle Island or race your bathtub around the harbour (seriously). Nanaimo Aquatic Centre One of Canada's most popular leisure centres. Three waterslides, wave pool, fishing boat, 50 metre swimming pool, fitness centre and across from our new twin ice sheets. Check out our Arts Scene From live music at restaurants and nightclubs to live theatre, Nanaimo has grown some great local talent, including Diana Krall. There is something for everyone to enjoy in Nanaimo. All this just in Nanaimo. When you include the beaches in Oceanside, caving at Horne Lake, a day trip to Victoria, the murals of Chemainus, Cathedral Grove near Coombs, Coombs Market, fishing in Campbell River, Saturday market on Saltspring Island, kayaking in the Gulf Islands and a quick trip to Tofino, Ucluelet and Long Beach, you can see why Nanaimo is your Vancouver Island Adventure Base! Nanaimo has been populated for at least 2000 years by the Snuneymuxw Coast Salish people. They lead a nomadic life moving their homes from Departure Bay to Newcastle Island and other locations in our regional area. The resources and food supply were plentiful. When European settlers moved to Snuneymuxw they changed the spelling of our town's name to reflect it's sound in English, thus the name Nanaimo was adopted. In the early 1800's the Hudson's Bay Company (HBC) discovered rich coal deposits in the area. HBC needed workers to mine the rich deposits, and they placed notices in British newspapers in the spring of 1854. Twenty-four English and Scottish families answered the summons, and travelled here by steamship. The Bastion Fort was built to protect the community and endures as our community's most recognizable symbol. Completed in 1853 it served as a storage, defense arsenal and clerk's office, with cannons at the ready to defend the community. The cannons were only fired a few times and the fort never fell under attack. Nanaimo's history has had a large influence from it's residents of Asian ancestry. In 1911 the Japanese-Canadians established a settlement on Newcastle Island that included a ship building factory, three herring salteries and a cannery. The salted herring was packed in large pine boxes and shipped to Asia. A number of Chinese migrants created their own community in the heart of the city at the turn of the century. A spectacular and controversial fire destroyed the settlement in 1960. In fact there have 4 different Chinatowns since 1860. By 1938 logging replaced mining as the major employer in our region and a pulp and paper mill was built near Duke Point. Eventually more mills were built and logging became the backbone of Nanaimo. Today Nanaimo is now home to world-class scuba diving, fish farming and research facilities, leading edge technology industries, call centres, regional shopping centres and a bustling university-college. Heritage walking tours are marked on sidewalks through the Downtown and take you to the buildings and places that have shaped our community. Markers, plaques and wall mountings give detailed descriptions of the historic value of the stops along the way. Spend a bit of time downtown learning our history and while you're there stop off at the Nanaimo Museum. You'll see First Nations artifacts and crafts, tour through old-time Nanaimo and the short-lived Chinatown and walk through a life-like replica of a coal mine. Outside is an authentic miner's cottage and railway engine. You can also enjoy noon-hour cannon firings at the Bastion Fort. Check out the red pagoda memorial to Nanaimo's Chinese pioneers on Stewart Avenue across from the Shipyard and the Vancouver Island Military Museum in Rutherford Mall. Take a wander through this site and see what intrigues you about Nanaimo. Better yet come for a visit and stay awhile. You'll have a hard time leaving. We look forward to welcoming you!